Application fields The application field of air heater is industrial factory building. 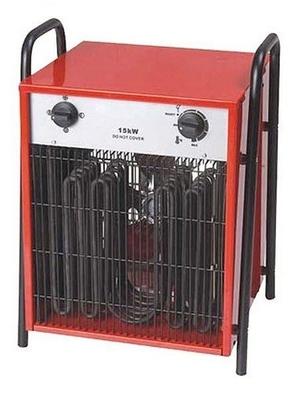 An air heater is an independent device used for space heating. It may be free standing, portable, suspended or built-in. While some may radiate heat, others may have a fan or blower to move the heat around by convection. The heat source may be electrical resistance, heated water or oil, or another system. While infrared and electrical resistance heaters may represent a greater fire risk, they heat up more quickly and provide drier heat than water or oil units. On ArchiExpo, an air heater are arranged by their characteristics (e.g., centrifugal). Such heaters are found in homes or offices as an alternative to central heating. When choosing an air heater, consider how powerful it needs to be, the volume of space it must heat and its installation configuration. In addition, consider its energy efficiency and maintenance requirements.